How Do I Get Luggage Compensation When The Airline Loses My Bag? Whether it’s a business or leisure trip, lost luggage when you arrive at the airport is one of those moments that all travelers dread. But claiming lost luggage compensation isn’t as hard as it seems. Follow AirHelp’s lost luggage guide, and learn how to claim compensation under the Montreal Convention. What to do if your bag isn’t at Baggage Claim. You must file a claim before you leave the airport. What luggage compensation can I get if my bag is officially lost? You get off a long flight and make your way to baggage claim. You wait and watch for an eternity as every bag circles the conveyer belt. You wait some more. It dawns on you then, your bag isn’t there. And it isn’t going to be. It looks like it’s only the clothes on your back for this holiday. Lost or delayed luggage is always frustrating. So you might consider choosing checked luggage over carry-on next time. Things are getting better though. 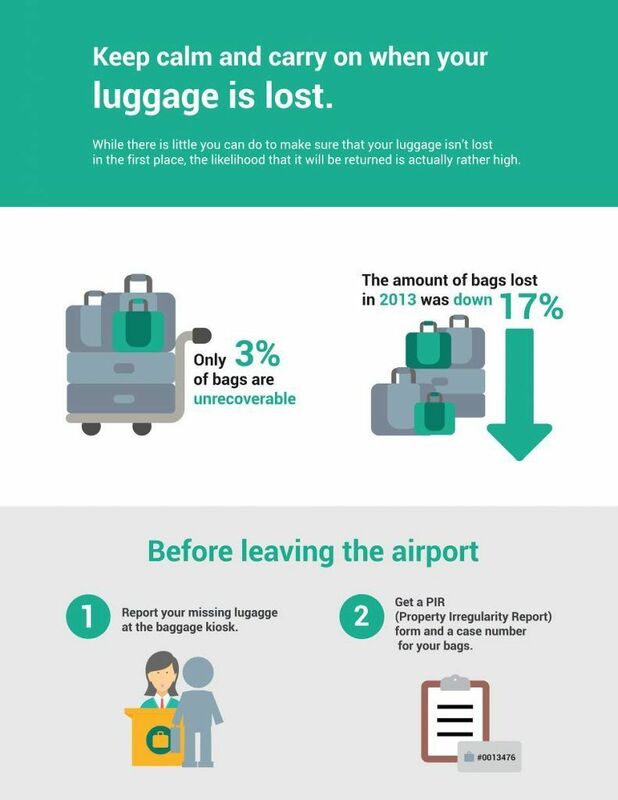 According to SITA travel statistics, the number of misplaced bags has dropped by 50% since 2007. Ok, so it’s not there. Stay calm, there’s a chance it’s at the baggage reclaim desk. Find out where it is and head there immediately. You’ll need to act fast to figure out what happened. Did you know you could be entitled to compensation under the Montreal Convention if the airline loses your luggage? Make sure you know your rights surrounding luggage problems. The 2003 Montreal Convention provides air passengers with certain rights to compensation on international flights between participating countries. More than 120 nations honor the regulation, including the US and EU, which covers a fairly large portion of the world. The convention also applies if your departure and destination are both within a single member nation, but only when there is a planned stopover in a different country. For example, imagine that you’re flying between cities in a member nation such as China with a stopover in Vietnam. Your flight would be covered. But if you had a direct flight instead, with no stopover, it would not be an “international” flight and would not be covered. Once you reach the baggage reclaim desk calmly explain your situation to a representative. Don’t rest until you’ve spoken to someone, have a pen in your hand, and are filling out a Property Irregularity Report (PIR) claim for your misplaced luggage. Be sure to note down the case number of your bags. The more detailed your claim, the better off you’ll be. Don’t leave anything blank on the form (especially contact information) and, if you can, provide an itemized list of what you packed, including the value of each item. You might not know this, but the airline is required to provide you with funds for a few “essential items” while you wait for your luggage to either turn-up or be declared “lost”. If you arrived at your final destination via layover, then you’ll want to file the report with the airline that operated your last flight. Making an itemized list of everything in your bag can come in useful later if your luggage never turns up. You could be eligible for compensation under the Montreal Convention. Normally, in these situations, your luggage turns up on the next flight or within a few days. But if 30 days have passed, and still no luggage, it will officially be declared as “lost”. Ok so, take some deep breaths. This is where the itemized list you wrote comes in handy. Contact your airline, and make a claim for compensation for the lost luggage. Be careful to report the value of items accurately, airlines often look out for exaggerated claims. The absolute maximum you can get back for lost luggage is $3,400 per person unless you purchased protection for a higher value prior to your flight. It can take from one to three months, according to The Department of Transportation. Did you know that the average compensation from an airline or checked luggage that is either lost or damaged is $1,525 – $3,500, under U.S. and Montreal Convention air passenger rights laws? Find out how to get your compensation here.